San Francisco is one of the most densely populated large cities in California with 825,000 residents spread out over less than 47 square miles. Nearly 14% of San Francisco residents are over the age of 65 and almost 25% of all San Francisco households have a resident over age 65. These demographics coupled with other factors put high demand on San Francisco’s long term care system and the City of San Francisco has among the highest long term care costs in the entire State of California. Long term care insurance is a form of asset protection. Our representatives can simplify the process of buying long term care insurance in the San Francisco Bay Area. Perhaps the most important step is planning ahead. This means obtaining your LTC protection while you’re enjoying good health. While many health conditions are insurable, other health conditions can make it impossible to buy quality long term care insurance. According to government statistics, about 70 percent of people over age 65 will require some type of long term care services during their lifetime. However, the need for long term care does not only impact seniors as 40 percent of people currently receiving long term care services are ages 18 to 64. 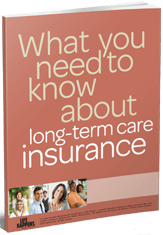 When San Francisco residents consider long term care insurance protection, it is important they know the local cost of care as it denotes how much long term care insurance should be purchased. One of the most comprehensive studies on the cost of long term care is conducted annually by Genworth Financial. The Genworth Financial 2018 Cost of Care Survey encompasses long term care costs nationally and surveyed more than 15,000 long term care providers in 440 regions. We are a California based insurance brokerage that specializes in long term care insurance coverage. We represent multiple top-rated insurance companies and believe in providing our clients with exceptional customer service. Our product knowledge and benefit design expertise with long term care planning is among the best in the country making us an outstanding resource for individual and corporate customers looking to obtain high quality long term care insurance solutions. Price comparisons customized for your specific needs from major companies like Genworth Financial, John Hancock, Transamerica, Mutual of Omaha, MassMutual and other top-rated carriers. Long term care insurance agents are available in San Francisco, Fremont, Hayward, Oakland, San Jose, San Mateo, Santa Rosa, Sunnyvale and the entire San Francisco Bay Area.